New Delhi / Ahmedabad : The man behind the mask describes himself as a creative businessman, not a political sycophant. Manish Bardia, chief executive of Ahmedabad ad agency The Moving Pixels Co., designed the uniform look that thousands of supporters of chief minister Narendra Modi have literally been donning. The idea came from an unidentified US-based Gujarati, who suggested using masks similar to candidates in the US. Samples of Hillary Clinton and George W. Bush masks—one aspires to be president, one already is—were sent to Bardia. “We thought it was a great idea," he said. “We just wondered if we could produce something like that here." While Moving Pixels works in animation, presentations and ad sales, it has also done work for the Bharatiya Janata Party (BJP) in recent years: corporate presentations for the government, three television commercials for BJP for this election, and the website for the party’s poll theme “Jeetega Gujarat". But the masks have been hailed as one of the most unique campaign tools in recent memory, gaining notoriety and publicity here and abroad. “The party was very clear since the beginning that Modi is the tallest leader in the state and BJP would garner support and votes in these assembly elections in his name," said Yamal Vyas, member of BJP’s media cell. “So, if you see, most of our advertising revolves around Modi, and a few hitting out at Congress and its policies." Over the last few weeks, in Gujarat, it has seemed that every other commercial is a political advertisement. The state unit of BJP prepared 18 short films, carrying messages by Modi. Despite the national watch on the election, Modi’s supporters say they—taking a cue from their leader—targeted the locals. Beginning 20 November, BJP bought anywhere between 1,000-1,500 second slots on all the regional and local TV channels across the state. The content primarily features Modi speaking on different issues, such as the development that Gujarat has seen during the last five years, with several potshots at the opposition scattered throughout. “We decided to focus only on local and regional channels so as not to waste any money," Vyas said. “Our target audience is the 37 million Gujarati voters." While public broadcaster Doordarshan bans political advertising, regional channels such as Enadu TV Gujarat and Zee Gujarati are the biggest players reaching four million homes. “Television advertisements played a big role in helping Modi reach out to his audience, in this case voters," said B.S. Bhatia, adviser for Media Lab Asia, a company formed by the government for innovative use of information and technology. But, he added, “there are large sections of people in the state who are still untouched either by print or television. Moreover, in rural areas whoever watches television is not necessarily watching your messages." Bhatia cited instances of the Congress party using street theatre to reach rural dwellers. On TV, too, the Congress went aggressive in election its campaign against Modi, but focused its efforts on more national channels. “Congress is ruling at the Centre and we wanted to fight the BJP at two fronts. One, we wanted to reach out to our electorate in Gujarat, highlighting pitfalls of the Modi government and the way we would make a change once in power, and also highlight to a larger national audience the BJP’s inability to provide proper governance in its strongest state, Gujarat," said a Congress leader, who did not want to be identified. But how much TV channels charged—or whether they charged at all—isn’t known. Some said the stations’ political leanings come into play, while another distributor said, on condition of anonymity, that only one ideology really matters: “Money," he said. “Elections are time to make big bucks." This person estimated that the parties struck a deal worth Rs15-20 lakh per network for commercial time. He said sometimes the money also leads to pressure to run favourable programming as well. The big three Gujarati dailies Gujarat Samachar, Divya Bhaskar and Sandesh, and local editions of English newspapers, The Times of India, The Economic Times and The Indian Express, cornered almost 80% of print advertising from the parties. All the other local dailies, fortnightlies and weeklies combined accounted for the balance 20%, a media buying representative said. Because Modi is more popular in the state than BJP, the media has played a role in making people favour him, especially among women and youth, said political analyst Ajay Umat, an editor of Divya Bhaskar. “His personality was easily promoted," he added. The content for BJP was prepared by a core team headed by its national party leader Arun Jaitley, who supervised and chalks out detailed strategy about advertising. Vyas would not discuss the spending, but other media representatives estimated that each party could be spending Rs15-20 crore for propaganda in just one month. Vaishali Shah, a 33-year-old Modi supporter living in Ahmedabad, said Gujarat was flooded with media campaigns about Modi. “He was very popular already and he’s done good work, so it was easy to build a media campaign around him." Shah said she has seen many people wearing the Modi mask. “I don’t necessarily think they would influence the educated classes, but they could certainly influence those in the lower ones because no one has seen anything like them." 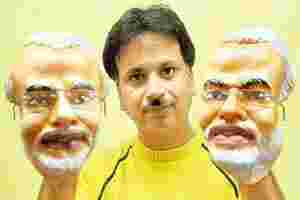 Moving Pixels’ Bardia specified that he did not charge the Modi campaign anything and that he simply designed the prop. Bardia and his team of four worked from hundreds of pictures and created moulds from various products, including silicon, wax, clay and copper. It took 15-20 days just to find the proper shape. The company asked Modi if he preferred a caricature-based mask or a reality-based one. He chose the latter. Bardia and his team created more than 100 samples of different colours, facial expressions and cutouts. Five versions were shown to Modi and he picked two—one with ears and one without. The 3D masks chosen were complete with wired-rim glasses, grey stubble and, most importantly, a smile. “People are going to wear it on their face and we knew we wanted to create a pleasant environment," said Bardia. “That’s why we chose a smiling face," he added. The masks were painted using water-based colouring, including spray and brush paint. The toughest challenge came in finding a manufacturer with a proper production line. The non-resident Indian, who paid for all the masks, arranged to have them made at a factory in China, owned by a US-based toy manufacturer. Bardia said he is not political; it is merely creative work for him. “We’ve never seen such a realistic mask like this in India," said Bardia. “I’m happy we succeeded." Saying that children and adults alike have been requesting the masks, Vijay Kumar Rupani, a BJP member who represents Gujarat in the Rajya Sabha, said they achieved what they set out to. “The party workers have worn the masks as a means to state that they support him and accept him as one of their own," he said. “It has been an interesting phenomenon."